If you are into antique hunting this a place you will want to put on your list of antique and thrift stores at the Oregon coast to check out. They sell a real variety of items like most of these types of outfits and depending on the time of year there will be different goods available. It is always wise to take your time and look through the merchandise to see what might be not easily visible in order to find a special treasure or a new artifact for your collection. My favorite local antique shop along the coast is the Frugal Crow, excellent prices and very customer friendly. They always have something unique and interesting every time I have gone in and the people that work the shop are very nice and open for conversation unlike some of the rougher coasty types that own antique stores along the coast. They also usually have a selection of toys and things that are perfect for keeping the younger kids entertained whether it is a box full of my little ponies for the girls or a tray of match box cars for the boys. The antiques and collectibles are displayed throughout the 5 rooms, while the store front is narrow the shop goes deep. The entire store is very reasonably priced except the back room tends to have more expensive vintage style furniture and art pieces that have always been outside my budget, but the rest of the shop is ripe full of great deals. I recently picked up some vintage post cards of locations throughout Oregon for a birthday present for someone and have bought many other knick knacks and other collectibles. They have a large selection of antique bottles which I have used to gather and hoard the beach agates that I find when out on my beach walks. This is a definite stop along the Oregon Coast as there is always parking available near the Frugal Crow due to its location right near the Rockaway Wayside that has a large parking lot near the beach access point. You can also take a short walk from the Frugal crow down to Trash & Treasure another antiques store and go into Rick’s Roadhouse for a burger and a drink. Rockaway Beach has a lot to offer the traveler on an Oregon adventure and stopping in the Frugal Crow for a browse is always worth the effort in my opinion. Open the drawers of the cabinets and find more than what is simply out and displayed. Too much to discuss in a single blog post so I hope you are able to take a few minutes to check out this shop the next time you are driving through on the Oregon Coast Highway. Will update with a good picture there is now a nice sign with the Black Crow logo, but this is where it is located, right next to a great candy and gift shop. Trash & Treasures located in Rockaway Beach right along the 101 Oregon Coast Highway is a great stop for looking for antiques and deal hunting. They have a wide selection of goods with something of interest for most collectors. Lots of trinkets in cases as well as larger items, books, tools, and more. Located right next to Rick’s Roadhouse, so if you were stopping by for a burger or a beer take a few minutes to walk around the store. The Oregon coast is full of great antique and thrift stores in every town from North to South and it is fun to take a break in your trip along the Oregon Coast Highway to check them out. This is the first post we have made about these types of stores along the coast, but will start to include more details about them in the future. New 2 Used is a large thrift store with a big warehouse and a couple of sections to cruise through. When you walk in there is clothes on the left, kitchen and bathroom stuff will be on the right. Along the windows are glass cases and antique items. there is a good section of electronic devices and parts in the rear and several larger furniture items and miscellaneous boxes of stuff. This thrift store has cabinets of craft and office supplies as well as some camping and fishing gear. 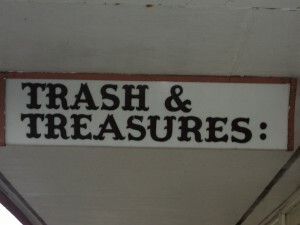 This thrift shop has a little of everything and is priced very reasonably on most items, so certainly worth your time to check out if you like to shop thrifty or like to find the unique and unusual. 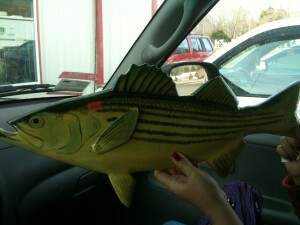 We picked up this cool carved stripped bass that is made of wood and painted. It was $3 and will be a nice addition to the fishing themed cabin that we are staying in at the beach. Due to being a relatively new facility the location is a field in the Google Map, but I can assure you it is the right location. New 2 Used is located in Tillamook right across from the Tillamook Cheese Association building that is right next to the Tillamook Cheese factory a popular tourist destination. If you are going to the cheese factory for an ice cream take a few minutes and check out New 2 Used across and do a lap through the aisles and you might get lucky and find something cool for a deal.